Do you need guidance when purchasing a sewing machine? Maybe you’ve recently started sewing on a borrowed machine and want to buy your first sewing machine. Perhaps you’re wanting to upgrade your current machine to something that will help you expand your sewing. 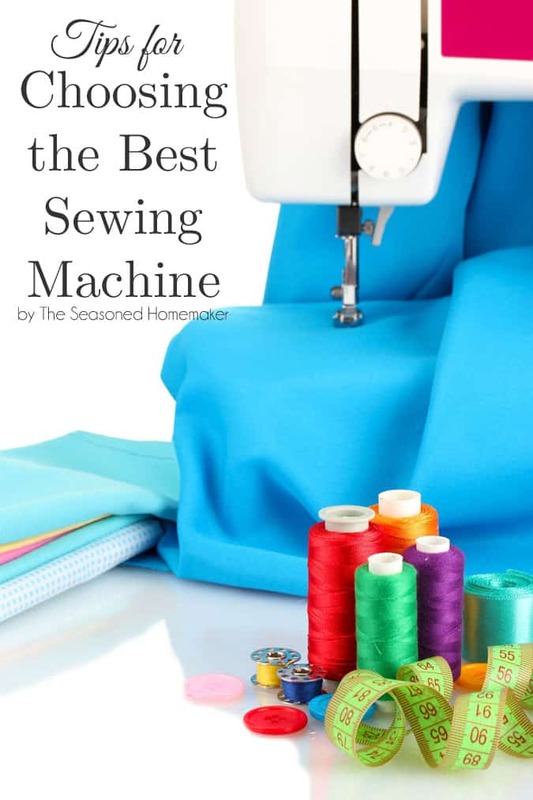 For most sewists buying a machine can be overwhelming because even inexpensive machines have features you may not understand. More importantly, you really need to consider what you may not need today but might want down the road as your sewing progresses. With so many brands, price ranges, features, and stitches, it’s hard to know where to start. I was not new to sewing, but I was new to computerized sewing machines. What I needed was a short list to help me begin the process of choosing a new sewing machine. To avoid my situation, I’ve armed you with a few tips that will prepare you to visit local sewing machine dealers in your area. They should allow you to try a variety of machines so you can start to see what will work best for your sewing needs. When shopping, refer back to these tips as you test different machines. Hopefully, they will help you make the best possible decision. PLUS, I'll send you a FREE Cheat Sheet with Tips for Buying a Sewing Machine. When setting a budget for purchasing a sewing machine my best advice is always to choose quality over bells and whistles. Of course, that will depend on your budget which ultimately determines the features that are available to you. If you have a very small budget, look for a great deal on a quality used machine. Find a dealer who takes trade-ins; they will have done a thorough maintenance on a machine and will give you a small warranty plus a class on operating the machine. If you need a machine that has a heavy-duty motor or some high-end features this might be a good route to take. There are also other options that can save you money. Several sewing machine manufacturers are making decent machines that don’t cost a fortune. The thing to remember with these machines is they are light weight (both a plus and a negative) and many of their parts are made from plastic. If a part breaks, you may not be able to get the machine repaired. However, there are a few highly, rated low cost ($150-ish) machines that can serve you for many years. This is a sewing golden question that is difficult to answer. 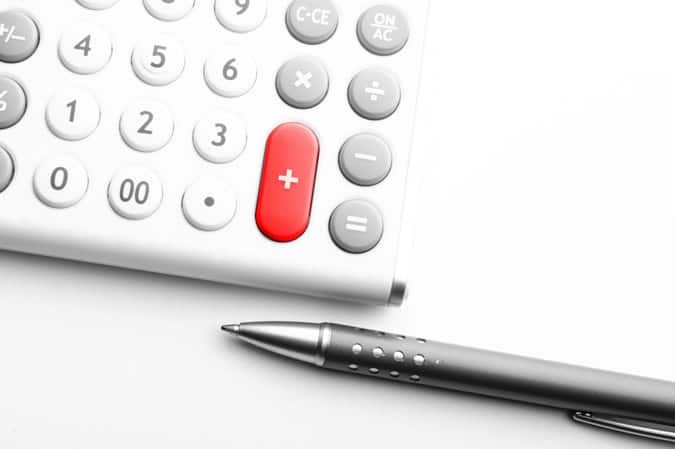 Once your budget is set then you can start deciding on some of the features that you’d like to have on your machine. The first question that comes up will be the number of stitches available on a particular machine. The key is not to be seduced by the number of stitches but rather choose a machine that includes stitches that you will actually use. At the core of sewing, you really only need two stitches to sew well: A Straight Stitch and a ZigZag Stitch. Almost all sewing can be accomplished with either of these stitches. That said, there are a few additional stitches and/or stitch features that I believe make sewing a little bit nicer. Straight Stitch: The straight stitch needs to be adjustable from 0 – 5mm. The 0 setting allows you to lock stitches and the 5mm stitch length allows you to baste and gather. Most of the time you will sew with 2.5mm stitch length. The ability to adjust the stitch length will give you more options with your sewing. Look for machines that make this easy. ZigZag Stitch: The zigzag stitch should be adjustable in both stitch length and stitch width. 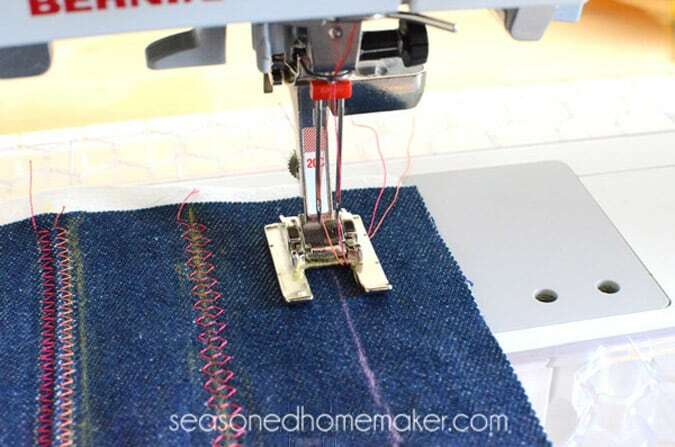 Buttonhole Stitch: Technically, a buttonhole stitch is just a zigzag stitch that is automated. Any machine that has a zigzag stitch should have a buttonhole feature. Even lower-priced machines have some sort of automated buttonhole option. If possible, try this feature out before purchasing a machine. Stretch or Knit Stitch: There are a couple of stitches that are ideal for sewing with knits. One looks like a ‘lightening’ symbol and the other is a triple stretch stitch. Both will allow the knits to stretch (and not pop the threads) once they are stitched. While a zigzag stitch will actually sew stretch fabrics well, special knit stitches do an outstanding job. Blind Hem Stitch: This stitch creates practically invisible hems on skirts and pants. Utility Stitches: Most machines will have a few utility stitches (which include stretch/knit stitches). These are good for securing seams and double as decorative stitches. Once you’ve sewn for a while you will know which stitches you would like to have. And when that happens, it’s usually time to upgrade to a new machine. Many machines come with some awesome features that make sewing so much fun. Needle Threader: High-end machines will have an automatic needle threader, while budget machines have a semi-automatic needle threader. Needle Up/Down: This feature allows you to stop the needle either in the up or down position which simplifies pivoting and turning fabric. Adjustable Speed Control: Allows you to adjust how fast or slow you sew. Perfect for difficult fabrics. Needle Position Adjustment: Available on high-end machines but available on budget-friendly machines. Allows you to move the needle either left or right. Ideal for zippers or top stitching. Lighting: Lighting on most machines has improved significantly. Look at the lighting to make sure you are able to adequately see what you’re sewing. Automatic Thread Cutter: Many machines have an automatic thread cutter. All you have to do is push a button and it cuts the thread. Test this on different machines. Some are better than others. Knee Lifter: This used to only be available on expensive, high-end machines, but now on modestly priced machines. It allows you to lift the presser foot while your hands are holding the fabric in place. Ideal for curves and sharp corners. I can’t imagine sewing without it. Free Arm: A removable piece from the sewing deck which allows you to slip something narrow (like a sleeve) under the needle. Sometimes doubles as a removable accessories storage box on the front of the machine. Attachments and feet will be specific to what you plan to sew. Quilters will want a Walking Foot, spring action foot, and a 1/4″ foot. Garment sewists may look for a zipper foot, overcast stitching foot, buttonhole foot, and button attaching foot. Many machines will come with all of these feet, however, lower priced machines might not have access to a larger variety of specialty feet. More expensive machines will have a better selection. Another thing to check on is the price of accessories and feet. Some manufacturers charge $30-$50 for their feet. A few manufacturers offer machines that have a more specific purpose. You may see the name of the machine with a ‘Q’ next to it. That means the machine comes with feet and attachments a quilter would want. On the other hand, I’ve seen a Project Runway sewing machine that is designed for people who want to make their own clothes. 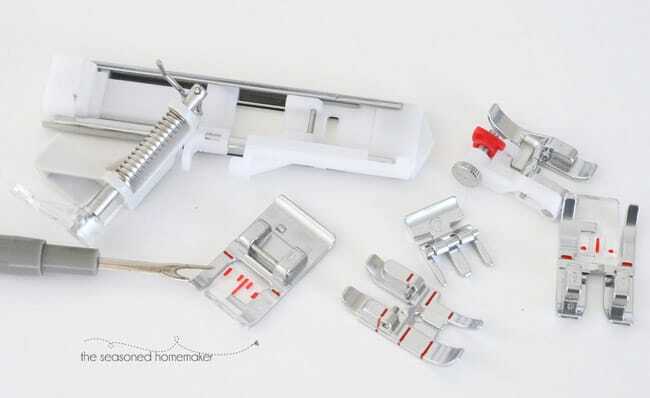 Be sure to look at the specific feet and attachments particular to your sewing plans. Sewing is about having the needle go up and down. How well a sewing machine does that can depends upon what’s inside the machine. Mechanical machines tend to be simple to operate and aren’t as heavy because they don’t have a computer. They require a lot less maintenance. If kept clean and oiled they will serve you for a long time, making it an excellent choice for someone on a budget. A well-maintained computerized machine will sew a beautiful straight stitch ~ every time. All high-end machines will be computerized in one way or another. 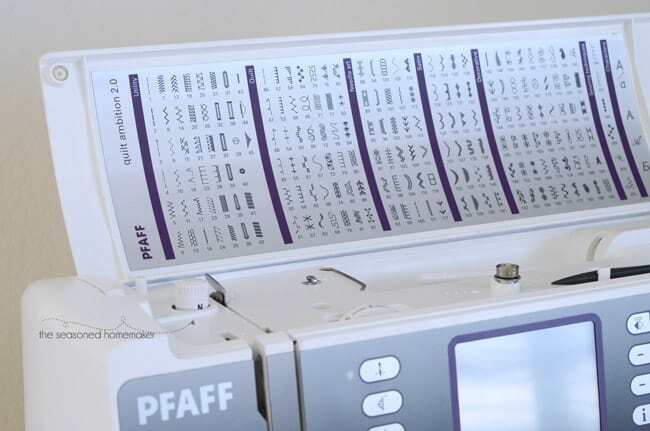 This simplifies stitch selection, stitch length, buttonholes, and programmable stitch sequences. Computerized machines almost always have a touch screen. One of the greatest benefits of a computerized machine is the motor. Because computerized machines are usually higher priced, they tend to have high-powered motors that are ideal for heavy-duty projects. A computerized sewing machine will likely need regular service by a professional. Consider a third option and that’s a machine that is considered electronic. It’s a hybrid of the mechanical and computerized machine. There is usually some sort of computer screen, but the machine is completely mechanical on the inside. When well-maintained, these machines tend to be worry-free. The electronics will usually include stitch selection, needle up/down, needle position, and a thread cutter. These machines have a decent selection of stitches and but don’t have embroidery capabilities. They usually sew beautifully. I always recommend that you purchase a machine locally and develop a relationship with your local dealer. If they are a quality dealer they will match you with the right sewing machine. A good dealer will have an excellent service department that will keep your machine in top shape for many years to come. 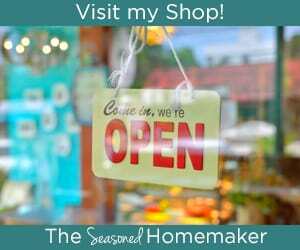 Before heading out to shop for a sewing machine, I recommend you do some research on various manufacturers. Knowing a little about the company that manufactures your sewing machine will help match you to the right machine and allow you to make the most informed decision. On that fateful Fall morning when I set out to expand my sewing horizons, I had no idea what questions to ask or what features I would want and use. I ended up purchasing a Babylock Ellure because it had most of the features I thought I needed at the time and was well under my budget. Had I been more informed I would’ve known what I needed and could’ve been paired with a slightly more advanced machine. With that in mind, I’ve created a downloadable PDF of this information. That way you can carry it with you when you’re shopping for a new sewing machine. perfect timing, thanks for the post on choosing a new sewing machine!I have a gold old reliable Kenmore that my parents bought me, used, when I learned how to sew in Home Ec ( 8th grade? 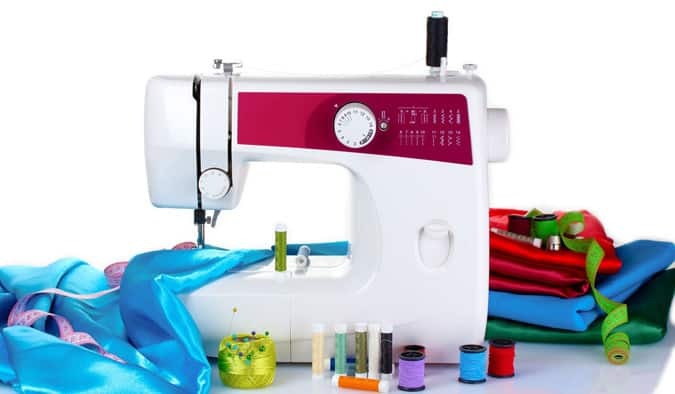 )I’m now a 50 yr old mother of 5 and my machine has had to go to the shop before I could start projects for the last few years, tangled bobbin thread, breaking needles, little things like that, and I justtold my husband that I’m going to startlooking for a new machine. thanks for the tips. I’m just sending off my great old, OLD Bernina for servicing. I have ALL the attachments, so hopefully when she’s all oiled up and cleaned, she’ll run like new. I feel these old machines are bullet-proof, although I’d love a serger. So true. I have an old Kenmore that will probably be running long after I’m gone. Thanks, for posting. I also have a Kenmore, matter of fact I have had two! I am looking for a heavy duty machine to work with blue jean fabric (demin). My Viking 1 is 23 years old and has been a wonderful machine. The on-off button and the button to lower the feed teeth stopped working and may not be able to be fixed. Someone has lent me Husqvarna Emerald122 for as long as I need it.This summary is invaluable for making a decision about buying a new machine. I’ve got a 1953 Singer Featherweight, nicknamed Dame Edna, that’s great for classes/retreats, as long as you’re only straight stitching. My warhorse is a Bernina 1000 Special (all mechanical) that I won at a quilt show in Albuquerque in the early ’90s. They still make them, according to my mechanic, though they have a different number (1005, maybe?). All the home ec classes and film studios near me use them. My main piece of advice to new sewers looking for a machine is to visit a dealer and look at the refurbished trade-ins. You can get a good, dependable– and all-mechanical — machine that way for not a lot of money. Then after you’ve been sewing awhile and know it’s not just a passing fancy, splurge on something with way more bells and whistles. My wife’s birthday is coming up. I want to get her a sewing machine, but I’m not sure what I should look for. I never knew that getting a machine that can do a zigzag stitch can give you the flexibility both length and width. I’ll be sure to remember this info moving forward. Thank you for mentioning how you should look for a sewing machine that has the type of stitches you need. It is important to remember that taking the time to do some research and to assess your needs carefully can help you find the best one for your money. My wife was talking about how she needed to get a sewing machine to help her with her sewing projects, so I’ll share your page with her. Thank you for writing this post. I learned to sew on my grandma’s Old Home sewing machine from the 50s. After many decades of use, it just wasn’t working well even with regular servicing. I’ve been in the dark as I look for a new machine. They are so different today. I appreciate your insights and look forward to exploring your site. Hello! This is a very useful post! Thanks alot! This idea really helps me to decide which to buy for my machine. Thank you for the helpful tip. I also owned an old Kenmore (circa 1972) that I traded in (one of my weak moments) And I’ve regretted it ever since. I’m now looking online for that same vintage model. What? Just because … It was a GREAT machine. And I’m Also looking for a Juki 2010 so your tips will certainly come in handy. Thanks!! I really like that you point out that I need to consider what features you want on your machine. I’m wanting to get a new sewing machine and need to find the right one. I’ll have to do some research and find the best machine for me.